In 2009, I was asked to build a website within a week’s time. The International Special Events Society (ISES) is comprised of over 7,200 professionals in over 38 countries representing special event producers (from festivals to trade shows), caterers, decorators, florists, destination management companies, rental companies, special effects experts, tent suppliers, audio-visual technicians, party and convention coordinators, balloon artists, educators, journalists, hotel sales managers, specialty entertainers, convention center managers, and many more. First established in 2002, the Big Apple Awards of the ISES New York Metro Chapter recognizes excellence in the special events industry through a variety of awards. As a major force in the professional development of today’s special event practitioners, the ISES New York Chapter’s recognition efforts are directly linked to our mission of educating, advancing and promoting the industry and its network of professionals along with related industries. ISES New York Metro Chapter board member Susan Bender approached me with the problem: ISES needed a website for the event within a week’s time. I built ISESBigAppleAwards.com in April 2009 with the help of Susan Bender. She helped me gather the content as I built the framework within WordPress, developed a theme to meet our needs, and designed the flow of the content. The Logo was designed by Rich Hauck of Hauck Interactive, Inc.. 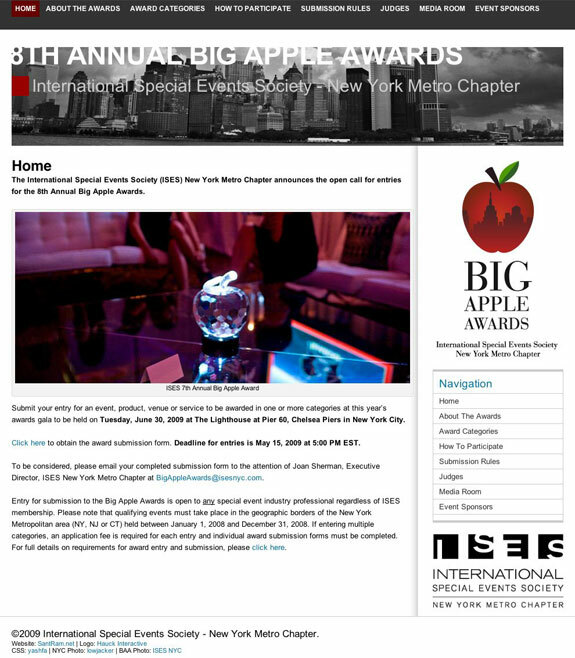 The ISES Big Apple Awards site was built within one week and enabled the New York Metro Chapter of ISES to reach out to their members and connect to the entire special events industry. The event was a success and the website was well received.